The ‘England Legends Live’ speaking event at the Sunderland Empire tonight, Tuesday 27 February 2018, has been postponed to Tuesday 13 March 2018 due to adverse weather conditions. The hazardous conditions, widely reported in the local and national media, have badly impacted travel to and around the North of England and especially the North East. The promoters wish to apologise profusely to anyone who booked a ticket for the show, and feel that the safety of the guests who are travelling long distances and also the guests watching the show who may have had to negotiate treacherous conditions is of paramount importance, which is why they have taken this decision. 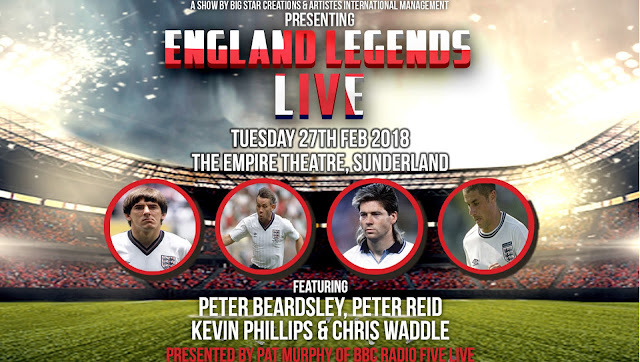 England and Sunderland legends Peter Reid, Kevin Phillips and Chris Waddle regret not being able to make tonight’s show and are already excited and really hope you can join them for their new date of Tuesday 13 March 2018. All customers will be able to move their tickets over to the new scheduled date of Tuesday 13 March 2018, or if they cannot make it then they can get a full refund from their point of sale. England Legends Live! are set to take centre stage (Tuesday 13 March 201827 February) at Sunderland Empire with four icons of English football ahead of the World Cup. Join: Peter Beardsley, Chris Waddle, Kevin Phillips and Peter Reid.